Busy families need easy meals. Make your weekly meal prep easy with this 3 in 1 Meal recipe. The Crock Pot Enchilada Shredded Chicken can be prepped over the weekend, or even cooked, shredded, and frozen to be used whenever you need it! This should make enough for 3 meals and perhaps even leave you with leftovers for another night depending on how many you are feeding! Inexpensive and easy, my favorite kind of meals! To make this chicken simply add your chicken breasts to your crock pot. I used 3 which was enough to create 2 meals for 2 adults and a toddler. If you have more family members or want to make even more meals simply add more chicken. Add a small can of enchilada sauce and then fill that can with water and add that to your crock pot. I used mild enchilada sauce but you can use whatever heat level you prefer. You want to have enough liquid to cover the chicken. Add salt and pepper to taste. Cook on low for 6-7 hours until chicken is cooked and comes apart easily with a fork. Remove the chicken breasts to a cutting board and shred with two forks. Store the chicken in a ziplock bag to keep the moisture in. (Add a few tablespoons of the sauce to the bag to help keep the chicken moist. If you’ve got picky eaters keep the chicken simple. If not, you can add in a can of diced green chilis and 1/4-1/2 cups of diced onions to your crock pot when cooking. I myself am a picky eater so I keep the chicken plain and add in the other items to part of the meat later. If you want to make more or less meals simply switch the amount of chicken you use, or freeze the extra to be used next time. There’s nothing easier than adding some chicken to a salad kit from the store. It’s a quick meal for lunch or dinner and it’s pretty healthy as well. 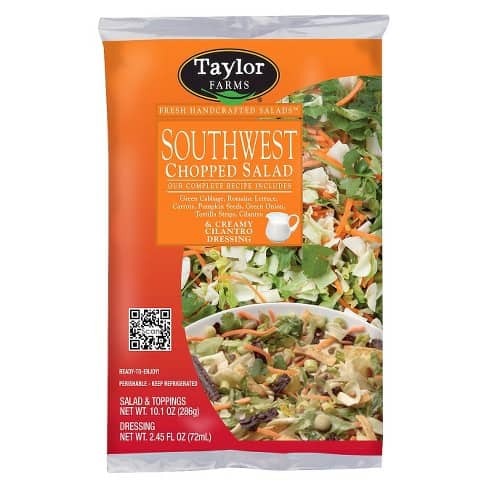 I added one shredded chicken breast to a Southwest Chopped Salad Kit from Taylor Farms and it was delicious. I know Cilantro is usually a love it or hate it type of thing so pick a different salad kit if you’re not a cilantro fan. 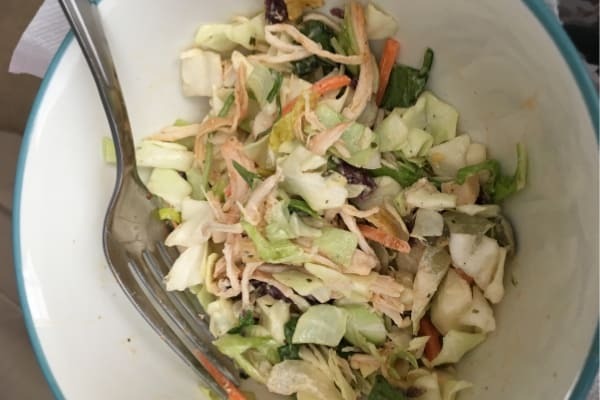 The salad easily fed my husband and myself and we had a little leftover. Simple and delicous! Enchilada Casserole is easy to put together and cooks up quickly. The best part, it’s easy to customize to fit different tastes. Check out the Enchilada Casserole recipe that’s part of my Easy Mom Meals section! Even my picky toddler liked this one! Buy some pre-made taco shells or tostada bowls and have a build your own tacos night. Everyone can add in whatever toppings they like best! To make the chicken more flavorful you may want to toss the shredded chicken in a pan with some water and chicken taco seasoning to warm it up.